Coastal fishing is one of Texas’ most popular recreational activities, and its future depends on quality management. That’s where Texas Parks and Wildlife comes in. Fisheries biologists and technicians are responsible for direct management of the resource. This entails getting fish into the water through hatchery efforts of breeding, raising and stocking fish. Just as important: educating the public. Texas Parks and Wildlife’s Outreach, Education and Communications teams take the lead there. It’s vital to help people to understand the value of the marine life and habitat. 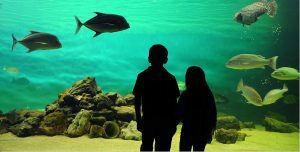 Whether you live on the coast or are visiting, a trip to Sea Center Texas fish hatchery and Visitor Center in Lake Jackson can help you on your road to understanding. At the hatchery they breed red drum, spotted seatrout and southern flounder for stock enhancement. The Visitor’s Center focuses on the importance of environmental stewardship. There’s something for the whole family. The goal of the center is to instill in the public a deep understanding of and appreciation for the role they play in the improvement and enhancement of our marine resources. Find more information about coastal fisheries and Sea Center Texas on the Texas Parks and Wildlife website. You are currently browsing the Passport to Texas weblog archives for the day Wednesday, September 12th, 2018.